The newly-announced Command & Conquer: Rivals is already getting torn apart online. Gamers are critical of EA’s decision to release a mobile version of the beloved C&C games. The backlash is similar to the recent Star Wars: Battlefront 2 and Harry Potter: Hogwarts Mystery backlashes. If we learned anything from the debacle surrounding Star Wars: Battlefront 2, it’s that gamers really don’t like Electronic Arts’ clumsy handling of massive game properties. That’s why it’s little surprise that EA’s release of a new mobile Command & Conquer game is already getting torn apart online. EA announced Command & Conquer: Rivals over the weekend at E3 by staging a live playthrough with real-time strategy experts iNcontrol and nickatnyte. One would think that a new C&C game would get fans excited, since the franchise has been primarily dead for almost a decade. However, fans are not excited. In fact, the internet is once again exploding with rage at EA for mishandling a beloved franchise. The predominant complaint surrounding C&C: Rivals is that it’s a mobile game. While mobile gaming is clearly popular – far more popular than PC games – fans argue that C&C belongs on the PC and that EA is needlessly porting the C&C gameplay to mobile as a cash-grab opportunity. After all, well-known franchise + mobile game = popularity. Related to that complaint is the fact that in order for a game as massive and complicated as Command & Conquer to work on mobile, the control mechanics have to be simplified. This results in a more accessible title, but one that will frustrate long-time players. Finally, just like with Star Wars: Battlefront 2, upgrades to your army can be purchased via microtransactions. Players don’t need to make these purchases to advance through the game, but payments make you progress faster, which will enable those willing to fork out cash more successful players than those who don’t. Electronic Arts is once again solidifying its reputation as a company that doesn't listen to its own customers. 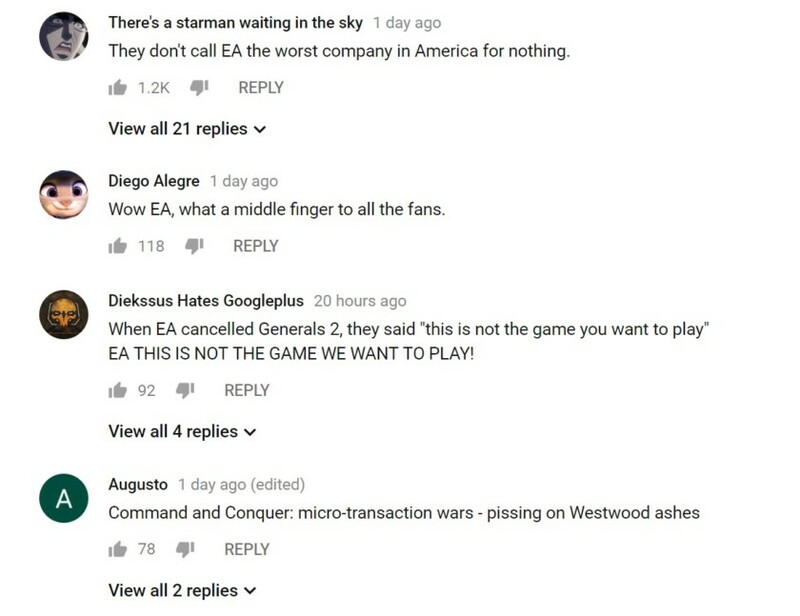 The overall implication made by gamers is that EA saw brand-awareness of Command & Conquer as the only reason to create a mobile game for the franchise. EA likely wants to compete with established mobile RTS games like Clash of Clans and Clash Royale, and it’s easier to do that with a name brand than to make a new game from scratch. Granted, Black was paid by EA to help polish C&C: Rivals, so his opinion here is a bit biased. But the fact that someone with C&C pedigree stands behind the game should set gamers at ease, at least one would think. A quick look at the YouTube comments on the announcement video at the top of this article paints a whole different story. With the backlash against the pay-to-play mechanics of Harry Potter: Hogwarts Mystery still fresh in our minds, it might take a lot more than some nice words from a person like Greg Black to get gamers on EA’s side for C&C: Rivals. C&C: Rivals is available for pre-registration right now on the Google Play Store. By pre-registering, you may be given access to the pre-alpha build, which will enable you to play the game early. However, all payment features are not yet live. What do you think? Are you a big Command & Conquer fan? Will you be giving this game a shot, or are you avoiding it on principle alone? Let us know in the comments!